Join Mr. and Mrs. Gnome as they test out and review two legendary metal dice sets by Darksilver Forge! There are a handful of companies producing different colors and styles of metal dice sets, but from our experience, Darksilver Forge hoists the bar high. Originally, Darksilver Forge began as Downcast Systems who produce mobile games such as Puzzlewood Quests and Hangman’s Noose. They decided to break from the digital mode and dive into the world of tabletop accessories. Some of the best features these dice sets offer include their weight and feel in the hand, the large, bold, and readable numbers, and the overall look. The gold and silver colors are awe-inspiring! While they’re nearly perfect, there are a few flaws. The weight appears to hinder rolls on the D20 and D12; both have no rounded edges compared to the other dice in the set, so your rolls land on the table without a decent roll. The weight is also concerning while rolling on various surfaces. 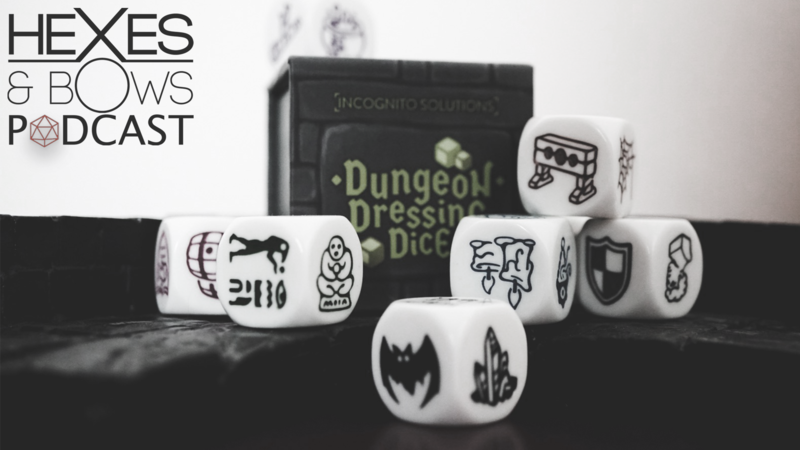 Do not roll these dice on a glass or wooden table, you will definitely scratch or dent softer surfaces and your wife or mom may straight up feed you to a dragon. Ultimately, for us here at Hexes & Bows, the Darksilver Forge dice sets are absolutely worth investing in. We’ve dubbed them a “luxury” set of dice as they are far superior in quality than your typical plastic set. These make great gifts for a brand new player or as a thank you to your weathered and exhausted DM. Each set costs $39.99, but are on sale for $29.99. Use the code hexes to get 10% off of your entire order! Go to www.darksilverforge.com to order your legendary metal dice set! From everyone here at Hexes & Bows, thank you. Thank you for taking time out of your busy schedule to hang out with us during our live D&D streams. Thank you keeping our podcast in your ears during your morning commute or lunch break. When I began shifting my focus from streaming on Twitch to publishing a weekly podcast showcasing awesome geeky things I love and things I love to share with awesome people, I never imagined we’d grow this fast. I never imagined people would reach out to us, let alone continue listening show after show. Thank you for sharing these new adventures with us at Hexes & Bows. We will continue to strive for excellence in entertainment and provide you with honest, in-depth reviews, heartfelt podcast commentary, and imaginative live streams. We’ve got some great things planned for the near future, so stick around! Our tale isn’t over yet! From the bottom of all our hearts, thank you for listening. H&B Podcast Episode 008: Did Someone Say Kickstarter? In this week’s episode of Hexes & Bows Podcast we wrangle up almost the full cast and dive headfirst into Kickstarters we’re super excited for! We also touch on our recent C2E2 adventures, chat about Star Wars roleplaying games (hey, it was May 4th, we had to! ), and lay out some plans for the future of Hexes & Bows!